Gone are the days when burning wood was your only option for a fireplace or stove. Presently, gas fireplaces and stoves are popular options due to convenience and efficiency when compared to wood-burning units. Gas hearth systems employ either a natural gas or a liquid propane fueling system, natural gas being more common and propane utilized where natural gas lines are not readily available. While the use of gas in hearth appliances began in the early 20th century, the popularity of these units has steadily increased for the last 50 years. Advances in technology, particularly in the increasingly realistic appearance of gas logs and flames, is persuading more consumers to choose gas over wood. There are many additional advantages to choosing a gas hearth system, including the fact the gas burns cleanly, meaning no more cleaning up ashes or buying/chopping wood again. Most gas appliances are marketed as "remote ready," meaning there are a variety of options to operate the fireplace remotely. One appealing aspect of a gas hearth appliance is the convenience regarding owner control of the fire itself. Most gas appliances are marketed as "remote ready," meaning there are a variety of options to operate the fireplace remotely. You can use a remote control, a wall switch/timer, or even a programmable thermostat to determine how hot and how long you want the appliance to operate. Many models also offer variable flame control, which allows adjustment of the flame height according to a desire for more heat or a better-looking fire. Gas fireplaces and stoves share another useful trait, ease of installation. Gas fireplaces can be recessed into a wall, placed into a mantel cabinet, built into the corner of a room, or even installed like an island in the middle of a room. There are multiple decorative options to these units, such as trim kits, liners, customized louvers, andirons and so much more. Freestanding gas stoves offer even easier installation, as you can just pick a spot, while observing all safety requirements, and place your new gas stove in the room. Gas stoves also offer plenty of decorative options with your choice of doors, shelf kits, inlay kits and much more. The most important of the advantages of gas hearth systems over wood-burning ones is the extreme increase in efficiency. The most important of the advantages of gas hearth systems over wood-burning ones is the extreme increase in efficiency. You can use a heater-rated gas fireplace or stove as a dependable secondary, or perhaps even primary, heating source and save a considerable amount of money on heating bills. 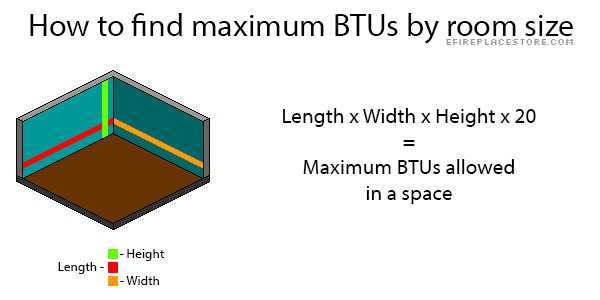 When looking for a gas-fired unit, be sure to look for the "BTU" rating. A BTU (British Thermal Unit) is a measure of heat energy, and as a general rule of thumb, 35,000 BTUs will provide sufficient heating for about 1,000 square feet. By no means is this an absolute measurement, as windows, doors, ceiling height, and other factors come into play, but it is a good starting point. Heater-rated appliances are meant to be used for heat output and thus carry the specific certification to be used as a primary or supplemental heating source, while decorative appliances are predominately for aesthetic purposes only. Below is a brief overview of the three common types of gas appliances, to give you an idea of which type you might wish to have in your home. Considered to be the most popular type of fireplace direct vent units are the most efficient vented appliances on the market. The same is true of direct vent stoves. 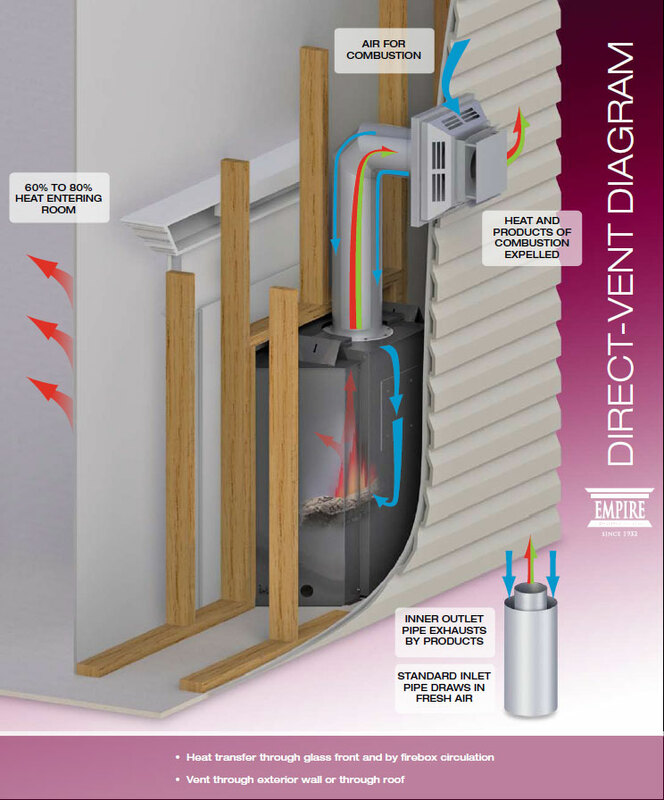 Each direct vent unit is closed-combustion, which means it is sealed off from the room with a glass panel and a coaxial (pipe-within-a-pipe) pipe supplies air in from outside for combustion while venting the exhaust directly back out of the home. You can never operate the direct vent unit without the glass panel securely in place. Originally, this glass panel was one of the biggest drawbacks to a direct vent system, but with the emergence of tempered glass and then ceramic glass, the original issues with reflections and glares have been dramatically cut down. Considered to be the most popular type of fireplace direct vent units are the most efficient vented appliances on the market. Many direct vent units are now employing ceramic glass, which not only provides a clear view of the flames but also collects less of the dangerous amount of heat that tempered glass tends to collect. Though ceramic glass is becoming the standard, there are still some mid to low end models that still use tempered glass. Making sure of which type of glass comes with the fireplace you are interested in is always a good idea. If you are unsure of the glass type of any model of direct vent unit we offer, we will be happy to assist you in determining which type of glass any direct vent unit has. One of the flaws with most direct vent fireplaces and stoves is the customer's inability to customize the actual fire. While many direct vent appliances offer variable flame control (flame height), the logs and burner that come with a direct vent unit are often married to it forever, so before you take the plunge and purchase a direct vent appliance, make sure the appearance of the flames and logs is to your liking. This being said, direct vent units have a more lifelike presentation of fires and flame patterns than vent-free units. As a vented appliance, direct vent burners can have flames that wrap around the artificial logs and create a more realistic fire. Vent-free units are handicapped in this area, as they cannot match the realism of the direct vent. For many, the difference in realism is one of the deciding factors between a vented or vent-free appliance. Now, however, several brands are offering direct vent fireboxes, allowing you to choose the media within. Kingsman has several models, like the MCVP42E, that offer several log sets or the ability to use fire glass instead. 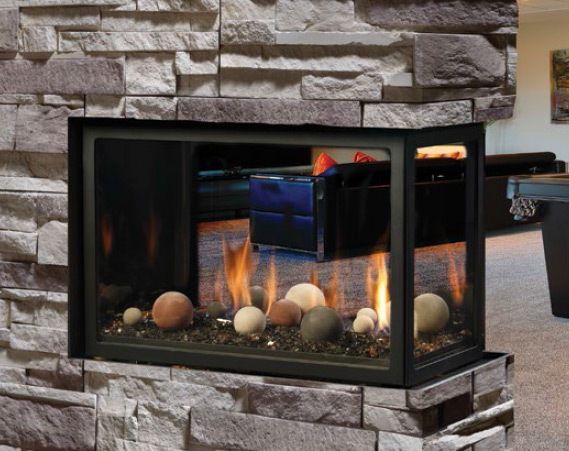 Napoleon is another of these brands, offering the choice of logs or glass on some of their direct vent models, like this HD81. Additionally, you have many more installation options with a direct vent appliance, such as in bedrooms or bathrooms. Since direct vent units exhaust to the outside of the living space, there are not the same requirements on these appliances as there are with vent-free systems. Direct vent hearth systems have a huge advantage over other vented hearth systems when it comes to the venting adaptability. Direct vent hearth systems have a huge advantage over other vented hearth systems when it comes to the venting adaptability. Where a B-Vent or a wood-burning appliance requires vertical venting all the way to at least three feet above the roof of your home, a direct vent appliance can be vented vertically through the roof or horizontally. This makes it possible to place a direct vent unit against an outside wall, run a few inches of pipe through the outside wall to an outside terminus and your venting system is complete. As such, almost all of our direct vent units have horizontal or through-the-wall venting kits that will include all necessary components to take away the confusion of figuring out all the pieces needed to put together a chimney system. If venting horizontally isn't an option, you can still build a vertical chimney system with direct vent appliances. Direct Vent Pipe is cheaper than most Class A Chimney Pipe, so a vertical run for a direct vent system is still likely to be a more cost-effective venting system. For more information about Direct Vent Pipe and venting options, visit our Chimney Pipe Buying Guide. Direct vent fireplaces and stoves also have a lower maintenance cost than vent-free units. A direct vent unit should be cleaned and inspected every season, and the glass should be cleaned regularly, but by and large, there are fewer maintenance issues with direct vent than vent-free. Always follow the instructions in the owner's manual for proper maintenance procedures of your hearth system. Vent-Free fireplaces and stoves are relatively new to the market, compared to the other types of gas appliances, but the appeal of vent-free fireplaces and stoves starts with the name. With no venting necessary, you don't have to worry about designing a chimney system or buying any venting pipe. They are also exceedingly efficient since the lack of a vent means no heat can escape through the chimney or flue. If you have a large, open room to heat, a vent-free unit is a great option. A vent-free fireplace or stove is also ideal for smaller homes and rooms where it would be impossible to build a chimney. With no venting necessary, you don't have to worry about designing a chimney system or buying any venting pipe. You should, however, be aware of some of the concerns with vent-free appliances. The most obvious would be that all the exhaust from combustion is going to stay in the room since it has nowhere else to go. The precise engineering of vent-free appliances is what makes this feasible; the burners are manufactured and designed to create almost 100% complete combustion. This means that exhaust from vent-free units will almost entirely be made up of water vapor and carbon dioxide, rather than dangerous gases such as carbon monoxide. If the vent-free unit is not running at maximum capacity, though, there is the potential for the release of harmful by-products into your home, and you could have problems with soot. In smaller rooms, vent-free units will shut themselves off fairly regularly. This is a case of a gift also being a curse. With no pipe for venting, all the exhaust goes back into the living space of the home. To some, this is a nuisance due to the bothersome smell of burning gas. Others may be concerned about the safety of those exposed to the combustion by-products in the home. This is a concern shared by many, and as a result, there are areas where vent-free appliances are illegal. Be certain to check your local codes to be sure that a vent-free appliance is legal before you finalize your purchase of such a unit. The obvious concerns about air quality have led to the addition of a special kind of pilot system to all vent-free appliances. Vent-free appliances come with an Oxygen-Depletion Sensor (ODS), which monitor the oxygen levels in the room and shuts the appliance off when the oxygen levels drop below a certain point. Most oxygen-depletion sensors will terminate the gas flow to the appliance between 18% and 18.5% oxygen present, which is roughly 3% above the level at which the human body starts to have issues functioning normally. While steps have been taken to avoid the gravest health concerns, vent-free fireplaces and stoves are still not necessarily healthy for everyone. If you or anyone who will be spending considerable amounts of time in your home have any respiratory issues, you may want to consider steering clear of vent-free units. Exposure to the exhaust from a vent-free unit may aggravate chronic respiratory conditions such as asthma and COPD. Another potential unpleasant side effect of a vent-free appliance is the odor; people with keen senses of smell may not enjoy the scent that vent-free units emit. Additionally, you should be aware that if you plan to use liquid propane as your fuel type, your vent-free appliance will release significantly more water vapor than natural gas. Propane-fueled hearth appliances are best installed in a large, open room so you can avoid fogged up windows, a humid, unpleasant atmosphere and the risk of mold and mildew. Vent-free appliances are also subject to more codes than vented units, with BTU output limits and installation restrictions. Vent-free fireplaces and stoves are limited to a maximum of 40,000 BTU/hour for most installations, with the lower limit of 10,000 BTU/hour and 6,000 BTU/hour for a bedroom or bathroom installation, respectively. This restriction on bedrooms and bathrooms is absolute, no matter the size of the room itself. When the time comes for a home inspection, such as when you might need to sell your home, a violation of this code will cause your home to fail the inspection. The National Fuel Gas Code has determined that vent-free appliances cannot be installed in what they term as "confined space," defined as a room with a volume less than 50 cubic feet per 1,000 BTU/hour of the aggregate input rating of all appliances in that space. Vent-free appliances are also subject to more codes than vented units, with BTU output limits and installation restrictions. If you have any hesitation or doubts about installing a vent-free fireplace or stove in your home, use this formula and check the BTU rating of any unit that interests you. Also, reading the owner's manual for any appliance to see the specific manufacturers' requirements can help you to choose which unit is right for you. As mentioned previously, there are more maintenance requirements for vent-free appliances, both in frequency and attention to detail. If you have pets, you will want to clean your vent-free unit much more often, as pet hair can block the air intake and cause poor performance or some of those nuisance outages mentioned earlier. One frequent issue with vent-free pilot assemblies is dust getting into the ODS, which causes outages or ignition failures. The DIY fix to this problem is to take a can of compressed air and gently blow it into the ODS or the gas line in the direction of the gas flow. Obviously, this would not be a concern with a closed-combustion direct vent fireplace or stove. It is strongly recommended, and in some places, required by code, that you have a gas specialist install your vent-free appliance. 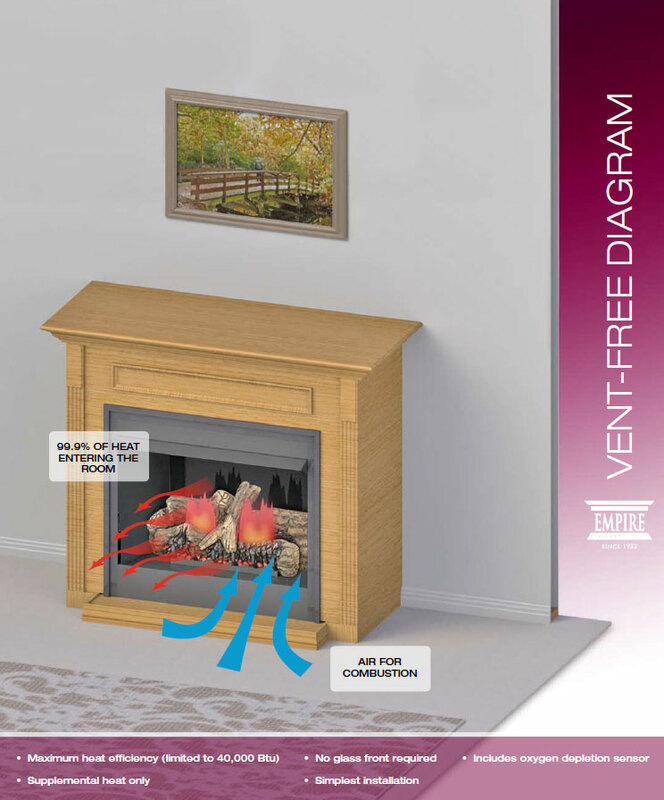 Each vent-free fireplace has very distinct and detailed installation instructions, as the logs must sit in precisely the correct spot on the burner, and the pilot assembly must be thoroughly examined and tested for proper operation. Simply put, everything must be in perfect order to prevent issues with oxygen depletion, carbon monoxide emissions, soot, et cetera. It is strongly recommended, and in some places, required by code, that you have a gas specialist install your vent-free appliance. There are still positive benefits to vent-free systems as well. Unlike direct vent units, vent-free units can be fully customized, from the firebox to the logs. There are matched systems, with firebox, logs and burner included, and fireboxes, without logs or burners. The advantage here is that you can choose the pieces that are aesthetically pleasing and that work together, allowing you to build a custom, to you and your needs, fireplace. We have many vent-free fireboxes, and ventless log sets available. Please note that everything mentioned earlier in this section about vent-free fireplaces and stoves in regards to the ODS and BTU rating restrictions also applies to ventless gas logs. Additionally, you should know that once a vent-free unit has been installed, it can not be converted to a different fuel type. Make sure that you are absolutely sure of your fuel choice when making vent-free choices. Vent-free fireplaces and stoves are, by nature, going to be extremely efficient, up to 99.9%. Without an escape route up a chimney or flue, the heat is going to stay in the room and provide significant warmth, especially on the more powerful models. Even if you have an existing woodburning fireplace, either masonry or manufactured, you may want to look into getting a ventless gas log set to install to take advantage of this kind of efficiency. However, this does mean that the appliance must be open to the living space, as there is no source for combustible air within a closed-off fireplace. Although vent-free appliances must be open, many of our units come with safety screens or offer them as accessories. Some models have screens that appear to be (or even referred to as) glass doors, but of course, they must be able to "breathe," so these screens are not solid. Some units may have an option to add glass or even come with glass, but these are installed in such a way as to allow air in and out of the unit. If you have children or pets, it would be wise to see what kind of screen any given vent-free fireplace or stove has to offer. Vent-free fireplaces and stoves are, by nature, going to be extremely efficient, up to 99.9%. The third and final kind of gas hearth appliance is the B-Vent appliance, which has been fading in popularity in recent years, becoming more difficult to find. B-Vent, also referred to as Natural Vent, appliances appeal mainly to builders and contractors, thanks to the affordability and relative ease of venting. In fact, out of the relatively few B-Vent stoves still on the market, most are dual B-Vent and Direct Vent stoves, which readily adapt to venting in either method. B-Vent, also referred to as Natural Vent, appliances appeal mainly to builders and contractors, thanks to the affordability and relative ease of venting. B-Vent pipe is usually smaller in diameter than Class A Chimney Pipe, which is used for wood-burning/coal hearth appliances, and it is much cheaper. However, B-Vent fireplaces and stoves have very poor efficiency ratings. 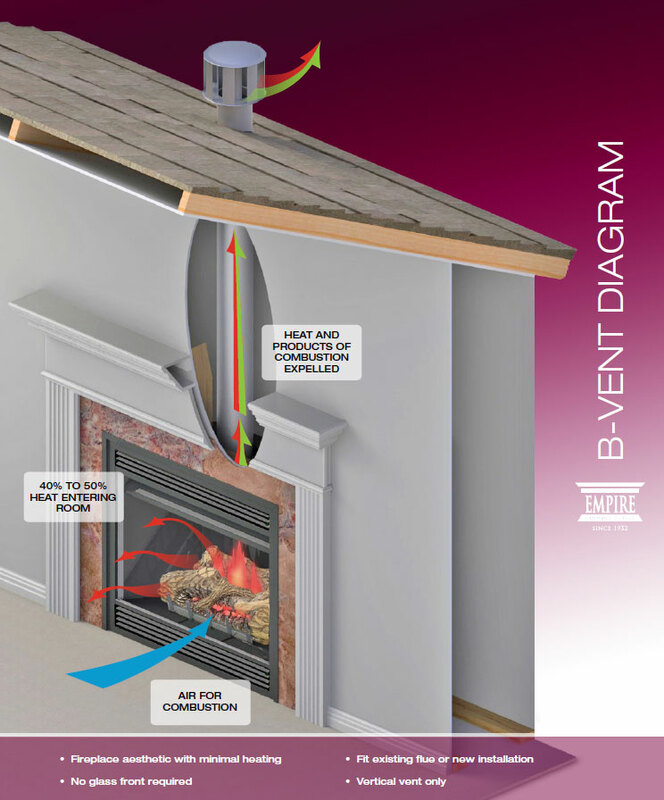 As with traditional wood-burning fireplaces, B-Vent units are open and use the air from the room for combustion. As a result, almost all of the heat produced will be lost through the flue or chimney, so don't expect B-Vent appliances to be reliable heat sources. You can learn more about venting B-Vent appliances by reading our Chimney Pipe Buying Guide. B-Vent units are becoming more scarce, and are gradually becoming a "builder-only" type of fireplace. Direct Vent and Vent-Free units are both much more efficient and, and in most cases, easier to install. The vast majority of consumers who choose B-Vent appliances are doing so for cost and aesthetic value, and they are not concerned with using it as a primary or supplemental heat source. With the rise of popularity in both direct vent and vent-free appliances, B-Vent fireplaces and stoves are slowly fading out of the market. hile they seem to be slowly slipping out of favor, B-Vent appliances still have their perks. They are lower in cost than the other types of gas hearth systems, and if you're looking more for aesthetics than heat, a B-Vent unit might be for you. Many B-Vent appliances offer remote ready controls, and the ease of service one expects with a direct vent appliance, but like vent-free units, have no glass front between the flames and your home. B-Vent appliances are the gas hearth appliance that most closely resembles a traditional wood burning fireplace, making them still a viable choice on the market. 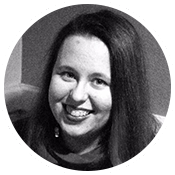 When you have chosen to go with a gas-fired appliance, and even when you've chosen from a direct vent, vent-free, and B-vent, there is one more set of options to choose from. This final set of options is whether or not you would prefer a fireplace or a stove. The difference is obvious, and it is mostly a matter of personal preference. 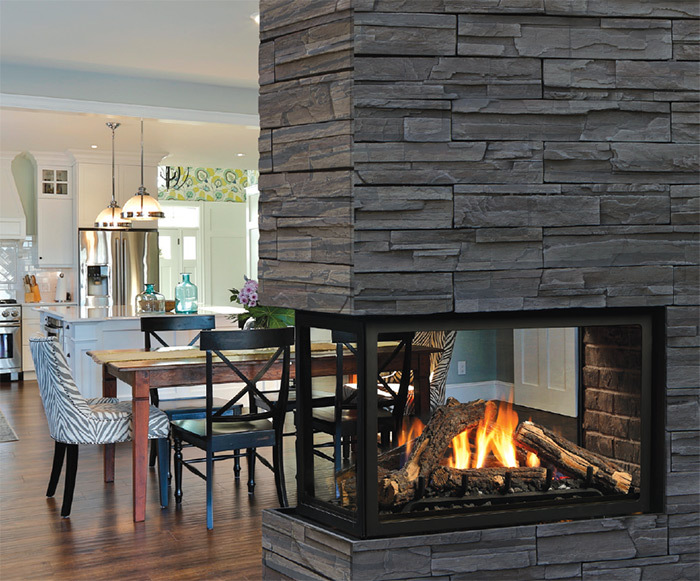 Do you prefer the look of a fireplace, or do you love the look of a freestanding stove? Fireplaces have more than just the old-fashioned, set into a wall installation now. Fireplaces have more than just the old-fashioned, set into a wall installation now. You've got installation possibilities of a peninsula (three-sided) or an island (vent-free four-sided). You can have them set high in the wall, making them a feature, or along the floor, allowing you to mount a television above them. Further, gas fireplaces are beginning to trend towards a linear design style, which makes them wider and narrower in height like this Empire Boulevard Direct Vent Linear Gas Fireplace, giving them a more contemporary design appearance. Gas fireplaces also offer the largest collection of fireplace media choices, from logs and fire glass, to even Kingsman's Cannonballs. Another advantage of stoves over fireplaces is the extra radiant heat the body of the stove provides. With stoves, you have a little more availability to customize the outer appearance of your new gas appliance, with decorative doors, sides, inlays, shelves, and more. Another advantage of stoves over fireplaces is the extra radiant heat the body of the stove provides. While these appliances still closely resemble the wood burning stove that they are modeled from, there are still some modern options to be had, such as this Kingsman Free Standing Direct Vent Stove. Be sure to look into all of your options with both fireplaces and stoves to make the best decision for you and your home, as your fireplace or stove will last for many years of enjoyment. If you still have questions or concerns about whether you should choose gas or wood, a fireplace or stove, vented or vent-free, we are more than happy to help. You can give us a call at 1-800-203-1642 or email us at info@efireplace.com if you have any questions. We also have an "Email Your Question" button on all item pages, a "Questions and Answers" area on all item pages, and you can ask our fireplace specialists questions via the "Ask A Specialist" button found near the top of category pages. Please let us know how we can be of assistance, and thank you for shopping at eFireplaceStore.com.